This was Mason's cake: chocolate cake with Swiss buttercream frosting. 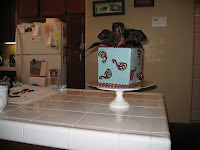 The brown swirls were made from pressed milk chocolate. This was the cake in-progress. 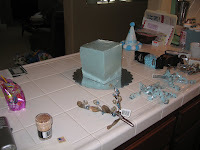 I didn't really know what I was going to do for the decorations on the cake and so I made it up as I went along. This is not the most time efficient way to work, but it all got done in time for the party. 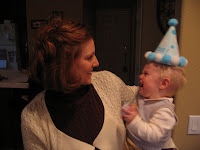 Mason just loves his party hat, can't you tell? It's funny, he'll wear any other type of hat, but when I put this one on his head, he just cried and cried. Well, we needed more table decorations anyway! 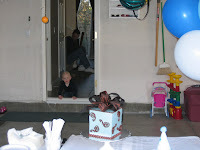 This was Mason's entrance to the party place (aka. the garage). Jay brought him down all spiffy and he was ready to celebrate! And this is it...garbage bins and all. With a few balloons and Chinese lanterns the place cleans up real nice. It really was perfect for our little get together, and the birthday boy didn't complain once. 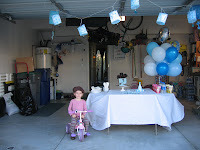 Now, we might hear something different when he grows up and realizes his first party was in the garage. Although I have it on good authority that guys prefer to be in the garage than almost anywhere else in the house! Stephanie, you did such a great job on this cake for Mason. Such talent! Where does the time rush to.....Mason was just born! He is such a doll! Enjoy him today, tomorrow and forever! We pray for him daily.